Microsoft released the very first Windows platform or operating system on November 20, 1985, even though Bill Gates announced its coming in 1983 as the Interface Manager. The release of the Windows 1.0 meant the end for Microsoft’s command-line DOS (short for Disk Operating System), but the first version of Windows could only support tiled windows It had, though, desktop features such as the MS-DOS Executive file manager, Notepad, Calendar, Terminal, Cardfile, Clock, Calculator, Clipboard, Print Spooler, and RAMDrive for managing memory cards designed to beat the PC’s 640KB memory limit, Windows Paint and Windows Write, Windows 1.0 even had a game, called Reversi. Windows 1.0 cost $99, as a special introductory offer. Microsoft released Windows 2.0 on December 9, 1987. This version could run on a dual-floppy-drive PC without a hard disk (just like Windows 1), and it was the first to introduce the Control Panel and overlapping windows and to support 16-color VGA graphics. The platform also had Program Information Files (PIF for short), that told Windows how to run DOS applications. Windows 2.0 was also the first Microsoft’s platform which could run Microsoft’s Word and Excel applications. Windows 2.0 used the real-mode memory model, limiting memory access to 1MB. Marketed from May 22, 1990, Windows 3.0 was the first Windows version to achieve widespread use on the market. This version saw significant interface changes (everything now looked much better thanks to this version’s support for 256-color VGA), as well as improved exploitation of the Intel 286 and 386 processors’ memory management capabilities. Besides, the third version introduced Program Manager and File Manager, along with a redesigned Control Panel and Solitaire game which remains a Windows staple to our days. Windows NT was launched on July 27, 1993. Born from the wreckage of Microsoft’s ill-fated partnership with IBM, this version was built from the ground up under the leadership of ex-DEC software engineer Dave Cutler. The platform was initially developed for the Intel i860, and its N-Ten codename fave the version its name (but Microsoft said later that NT meant New Technology). Windows NT 3.1 was a fully 32-bit pre-emptive “multitasking, multithreaded, multiprocessing, multiuser operating system”. It was equipped with a hybrid kernel and a hardware abstraction layer to facilitate porting between processor platforms. Various NT variants have appeared on many CPU architectures through the years, including IA-32, x86-64, MIPS, Alpha, PowerPC, ARM and Itanium. Microsoft released Windows 95 on August 24, 1995. The platform entered the market with unprecedented push. Microsoft used the Rolling Stones song Start Me Up to introduce its new platform. This operating system was a consumer-oriented hybrid 32-bit/16-bit OS with a brand-new user interface. Many new features were built in, such as plug-and-play automatic device detection and configuration. Its user interface saw the first appearance of the long-running Windows features such as the Start button and menu. The platform had the taskbar and system tray or notification area, as well as maximize, minimize and close buttons on windows. Available in Workstation and Server versions on August 24, 1996, Windows NT 4.0 was followed by Server, Enterprise Edition in 1997 and Terminal Server in 1998. Windows NT 4.0 added the Windows 95 user interface to the fully 32-bit, business-oriented operating system. NT 4.0 included a number of architectural improvements. In particular, the Graphics Device Interface, or GDI, was moved into kernel mode, giving a significant performance boost over NT 3.5x, although this also required graphics and printer drivers to be updated. NT 4.0 was the first Windows version to support the DirectX multimedia API. 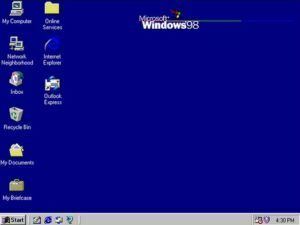 One of the best known and famous versions, Windows 98 was launched on June 25, 1998. Its popularity was due mostly to more consumer-friendly interface than its predecessors. Besides, a range of user-interface enhancements were introduced via the bundled Internet Explorer 4’s Windows Desktop Update. The improvements included the Quick Launch toolbar, Active Desktop, the ability to minimize a window by clicking its toolbar icon, plus backward and forward buttons, and an address bar, in Windows Explorer. USB support (first introduced with Windows 95 OSR2.1 in April 1997), was also improved in Windows 98. It encompassed keyboards, mice, joysticks, hubs, scanners (but not modems, printers or storage devices). Windows 98 SE followed suit. This version was introduced on February 17, 2000. It was built on the Windows NT 4.0 code base and replaced both NT 4.0 and Windows 98. Windows 2000 Professional brought important improvements such as plug and play with full ACPI and WDM support. It also offered many features designed for the Windows 98 and Windows 98 SE product line. Windows 2000 edition introduced NTFS 3.0, the Encrypting File System (EFS), Logical Disk Manager, an LDAP/Active Directory. Besides Windows File Protection prevented unauthorized programs from modifying critical system files. The customer-focused Windows ME (short for Millennium Edition) was released on September 14, 2000. This was the last of the DOS-based Windows 9x line. However, the Millennium Edition is widely regarded as one of the worst Windows versions Microsoft ever released, because this hurriedly released version was notorious for being buggy and crash-prone. Minimum system specifications for Windows ME were a 150MHz Pentium processor with 300MHz recommended, 32MB of RAM (64MB recommended), and 320MB of hard disk space (2GB recommended). The system could address up to 1.5GB of RAM. Unlike Windows 95 and 98, Windows ME lacked real-mode DOS support. It included, however, the System Restore feature, which allowed users to take the system back to a previous stable configuration. Windows ME was quickly superseded by the far superior NT-based Windows XP. Windows XP was introduced on October 25, 2001, and initially came in Professional and Home versions. This version, equipped with a couple of Service Packs under its belt, XP – for eXPerience – proved to be one of Microsoft’s most successful Windows releases ever. It extended support for this durable OS ended on April 8, 2014. That’s it lasted for an unprecedented twelve and a half years after its launch. The XP user interface was very friendly. Indeed, it featured an updated two-column Start menu, task-grouping support on the taskbar and the ability to lock the taskbar, among other enhancements. Microsoft presented all the improvements in a new default Luna visual style. On April 24, 2003, the server version of Windows XP came in Web, Standard, Enterprise, and Datacenter editions. It succeeded the respective editions of Windows Server 2000. Key new features included Active Directory enhancements; the Manage Your Server tool for administrating server roles; version 6.0 of the IIS web server. A better Group Policy handling and administration was added; a backup and restore system, as well as improved disk management; and enhanced scripting and command-line tools. Windows Vista came on January 30, 2007. This controversial system had a convoluted gestation, a delayed birth, and a relatively short life. Many remember Windows Vista as a particularly ill-conceived Windows release. The main complaints centered on security features, digital rights management, hardware requirements, hardware performance and software compatibility. Longhorn (Vista’s codename) was built on Windows Server 2003 SP1, having jettisoned key features such as WinFS. Features included the Aero interface, which with the right hardware displayed transparent windows and other visual effects, and a redesigned Start menu. This platform was presented to the public on February 27, 2008. It was built on the same code base as Windows Vista. Windows Server 2008 included new features like Network Access Protection (NAP) which checks that PC connects to the network are complying with IT policies; Server Core, which installs a minimalist Graphical User Interface and a limited set of server roles, PowerShell and Read-Only Domain Controllers. Existing components such as IIS, Terminal Services and the SMB file-sharing protocol also received thorough overhauls. On October 22, 2009, Microsoft launches Windows 7, which quickly made inroads into Vista’s and XP’s market share. Windows 7’s main new interface feature was the redesigned taskbar, which featured the translucent Aero look, thumbnail previews with live content, Jump Lists of recently-opened files and Aero Peek for minimizing open application windows to view the desktop. It also had Windows Media Player 12 with Internet streaming support, a Device Stage for managing peripherals from one convenient location, fewer User Access Control prompts, faster indexing for the native search, improved touch functionality and a virtualized XP Mode for running legacy applications. Windows Server 2012 was released on September 4, 2012. It came in four editions: Foundation, Essentials, Standard, and Datacenter. The platform offered advances in virtualization, storage, networking and automation, positioning itself not only as an upgrade for traditional file/print/application/Web servers, but also as an enabler of private, hybrid and public clouds – in combination with products such as System Center and Windows Azure. WS 2012 could be installed in command-line Server Core mode or with the Windows 8 graphical interface (known as Metro), or in a hybrid cut-down GUI mode. Server Manager was the main GUI element, while PowerShell gained a multitude of complaints for managing in Server Core mode. Windows 8 came on October 25, 2012 in three 32-bit and 64-bit x86 editions: Windows 8, W8 Pro and W8 Enterprise. A fourth system was Windows RT for ARM-based system. The Enterprise edition was only available to Software Assurance customers, and included the Windows To Go feature for creating secure bootable USB flash drives. Pro and Enterprise, which can join Active Directory domains, were the business-oriented editions. For Windows 8, Microsoft developed features that accommodated touchscreen devices such as tablets and laptop/tablet hybrids. The traditional Windows 7-like Desktop, minus the Start button, was still present with Windows 8, but the system booted into the new-look Start screen. Microsoft released this version on October 17, 2013. The headline feature in Windows 8.1 was the partial restoration of the much-missed Start button on the desktop taskbar. However it was not the classic Start button, but a visible button for accessing the more customizable Start screen. On Windows 8.1 users can go straight to the desktop on login, and configure the desktop Start button or Windows key to go to the Apps page rather than the Start screen. Essentially a service pack for Windows 8, version 8.1 is a free download from the Windows Store. Other new features in Windows 8.1 include enhanced search, more bundled Windows Store apps, the ability to display and use up to four apps side by side, deeper SkyDrive integration and a redesigned Windows Store. Windows 10 was launched on July 29, 2015. Windows 10 includes an expandable Start menu with Live Tiles, which is presented full-screen by default on touch-enabled devices. This operating system is designed to be a unifying release in which universal apps, with appropriate UI behaviors, run on a wide range of platforms: embedded systems, smartphones, tablets, hybrid tablet/laptops, laptops, desktops and games consoles, as well as new hardware categories such as large-screen collaboration/presentation systems (Surface Hub) and AR/VR headsets (HoloLens). Windows 10 is available in seven editions in total: Home, Mobile, Pro, Enterprise, Education, Mobile Enterprise and IoT Core. New features include FIDO-based multi-factor authentication and improved support for biometric technologies (Windows Hello), a new default web browser (Microsoft Edge), the Cortana virtual personal assistant (previously introduced with Windows Phone 8.1) and DirectX 12/WDDM 2.0 for improved graphics and gaming functionality. Overlapping windows and other Mac like features in Windows 2.0 resulted in an ultimately unsuccessful Apple lawsuit vs. Microsoft in 1988. The developer Brian Eno wrote the start-up jingle for Windows 95 on Mac. What an irony! We offer the best possible rates that you can get in both local and Internet markets, as we base our evaluation on an in-depth industry analysis. And we respect our customers! Sell your old electronics online now and get the best cash for it – Sell Microsoft Surface now! Video published by Windows Expert on June 20, 2016. Windows is great for people like me, but with the last updates and all the time it request to update without the option to block the updates, it may even irritate the user. But I won’t switch to Apple by now. I may be wrong, but I give Windows one more chance.